Several pieces are displayed that AP Art students have been working to perfect for the Scholastic Art Awards. This year, WHHS received more awards for artwork than in any previous year. On Jan. 10, WHHS’s AP Art students anxiously waited as the regional Scholastic Art Awards were announced. This year the students’ work earned 80 awards, 22 being gold keys, the most ever in WHHS history. 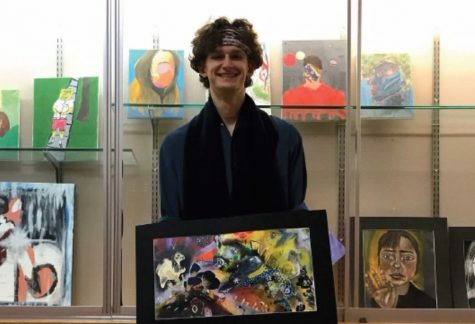 SENIOR Arthur Schmid was the only AP Art student who was awarded a gold medal portfolio. The Gold Medal Portfolio award includes a $10,000 scholarship and is only awarded to 16 recipients across the country. Beyond the Gold Medal Portfolio, students could win gold keys, silver keys and honorable mentions. Gold keys are awarded to the best works in the region and automatically qualify for national recognition. Silver keys are awarded to standout pieces and honorable mentions are awarded to pieces that demonstrate potential and hard work. SENIOR Arthur Schmid stands above with one of his award-winning pieces from the Scholastic Art Awards. Schmid combined many mediums to create his masterpiece. Schmid wasn’t the only student who won big this year. Other winners this year include Alexandra Franz, ‘23, Drew Hart, ‘20 and Julia Johnson, ‘22. Franz earned 19 awards for her drawings and paintings including seven gold keys, five silver keys and seven honorable mentions. In addition to winning the most awards of all of the WHHS students, Franz was also the youngest WHHS student to compete. Hart received nine awards for his photography: one gold key, four silver keys and four honorable mentions. The pieces he submitted centered around the exploration of abandoned Cincinnati. 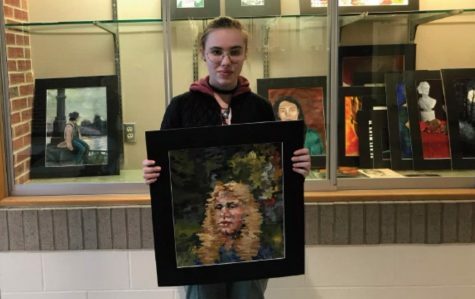 Now that the regional winners have been announced, the winners will be matting their pieces in preparation for the Scholastic Art Awards Exhibition that will be open Jan. 28-Feb. 8 at the Art Academy of Cincinnati.